Shadeland, PA - On Sunday, August 7th, Serbian communities from across the Eastern American Diocese of the United States travelled to St Sava Camp in Shadeland, PA. The diocese gathered in unity around His Grace Bishop Dr +Mitrophan, celebrating the Holy Hierarchical Divine Liturgy with 27 priests and 1 deacon. Additional priests assisted during the service, and St Sava campers led the congregation in singing the responses. During the Hierarchical Divine Liturgy, His Grace Bishop Dr +Mitrophan bestowed the honor of wearing the pectoral cross upon Fr Zivojin Jakovljevic, former cathedral dean of St Sava in Parma, Ohio, and now current dean of St Sava Cathedral in New York City. 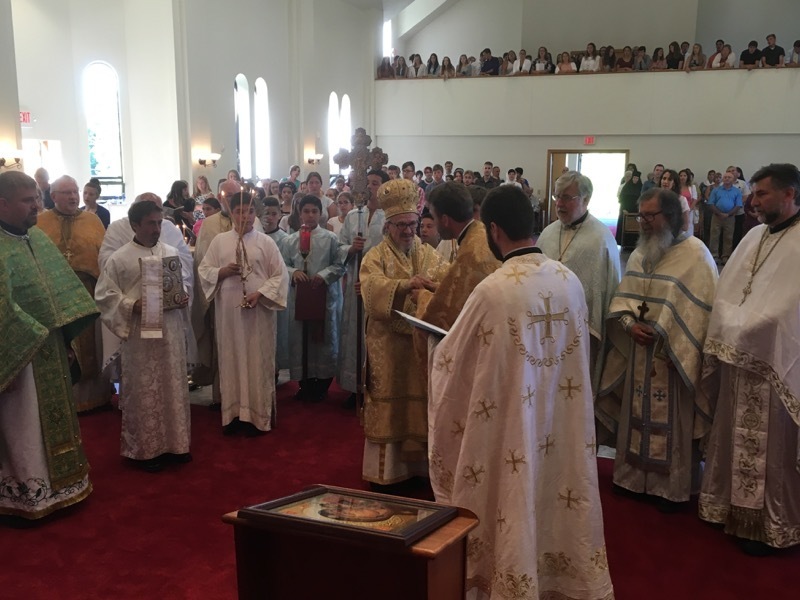 His Grace also bestowed the rank of “Protopresbyter” upon Fr Milan Pajich, parish priest of St Archangel Michael in Akron and co-director of the St Sava Camp. His Grace concluded the service by offering a timely homily, reminding the faithful present, and the youth in particular, about the challenges we face as Christians in this modern age. He advised them to be wary of the technology and availability of information that is so pervasive in our modern life as it can be harnessed for both positive spiritual growth as well as spiritual destruction. Following Divine Liturgy the fourth week campers offered a music and dance performance in the pavilion. The final week of camp is a time set aside for many students involved in folklore and music programs in their home parishes to grow together and share the joy of their faith and heritage through song and dance. It was a day of great joy for the Eastern Diocese of the Serbian Orthodox Church!